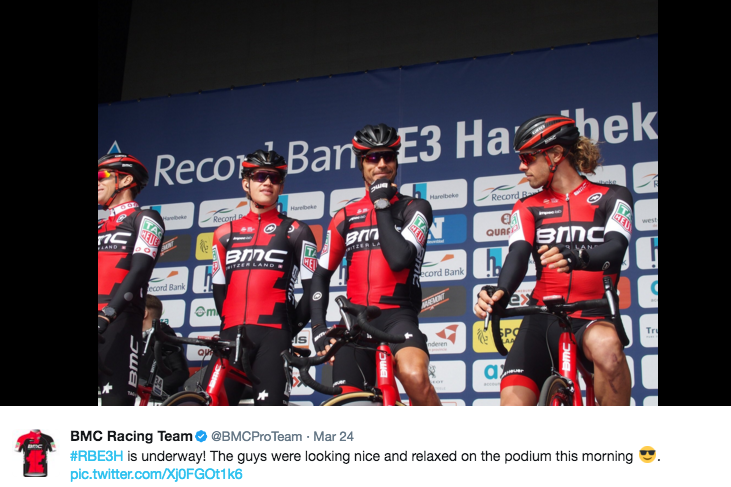 Tweets of the Week: No ride, no win … this isn’t a cheap game! Holy moly! 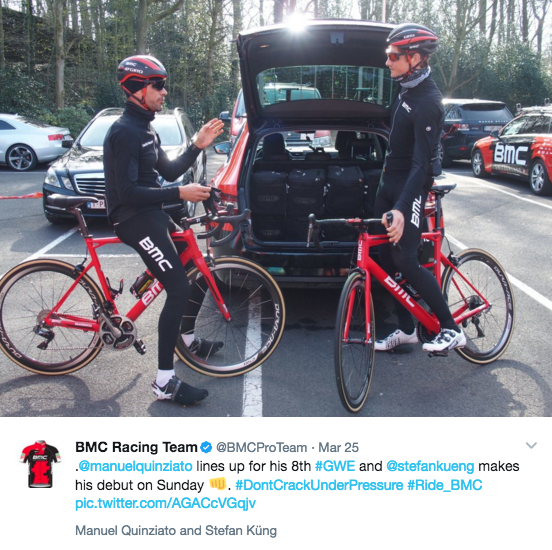 A triple from golden boy Greg Van Avermaet and some very tough love from Peter Sagan in Gent-Wevelgem; Ladies Favourite™ Bernie Eisel has a few words for us; Fabian Cancellara spills his skittles on the way to the airport and The Two Worlds of Manuel Quinziato. 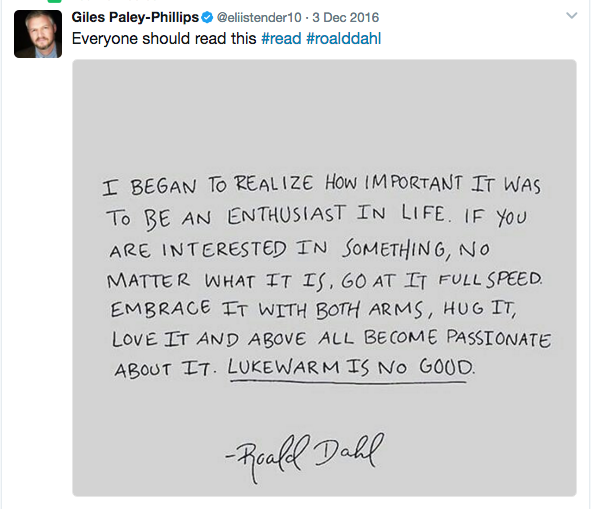 It’s a fast-paced, elbow-flicking Tweets of the Week! 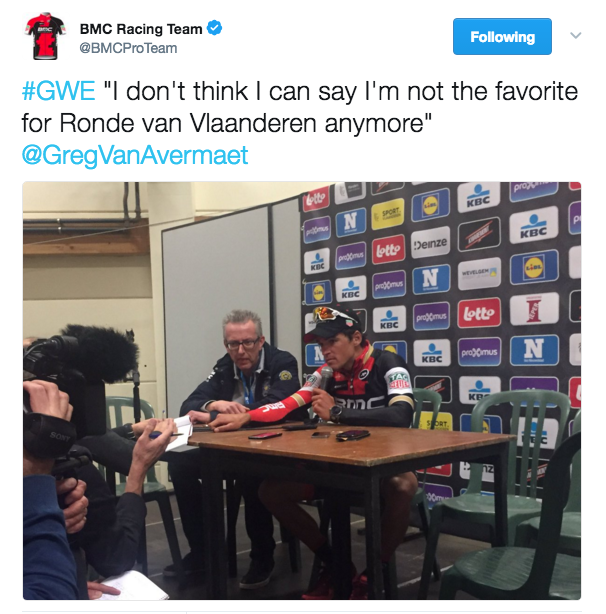 We’ve said it before – on the podcast, in our reviews, even in this column – but since his gold in Rio2016, Greg Van Avermaet has turned over a new leaf and is on fire. 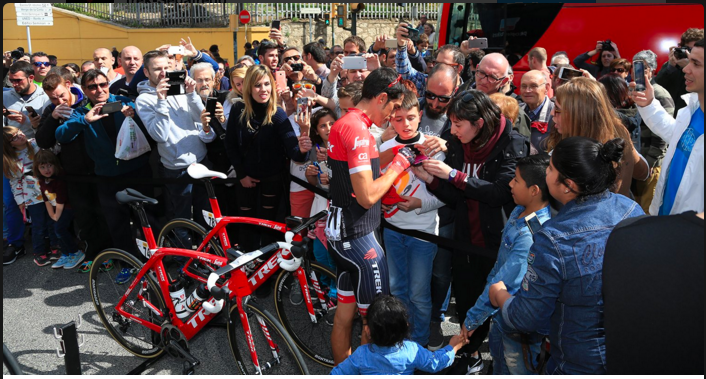 He always had the potential to be an epic Classics rider – this season, he seems intent on proving it. Chapeau! 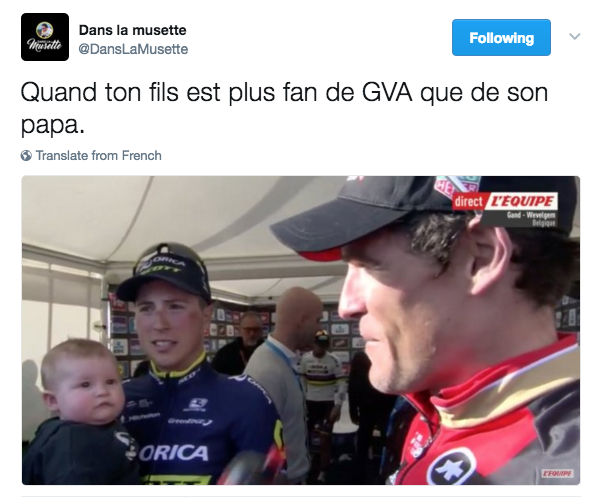 Mini-Keukeleire is not afraid to have a stare-down with the man of the moment. 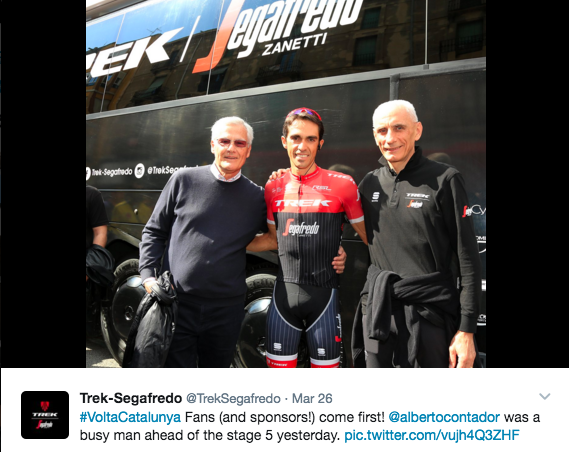 Seriously – he looks ready to Ronde! 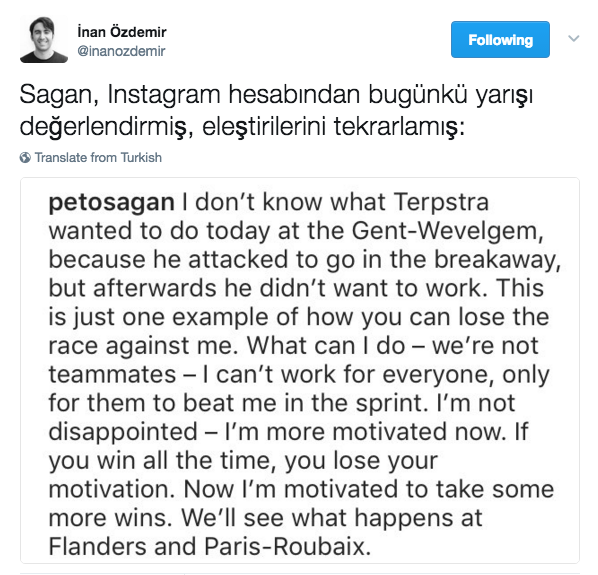 SuperSagan decided to throw an elbow on Sunday – as in making sure riders with him in a break (>cough< Niki Terpstra >cough<) knew he wasn’t going to do all the chasing and drag everyone to the line, box fresh behind him. 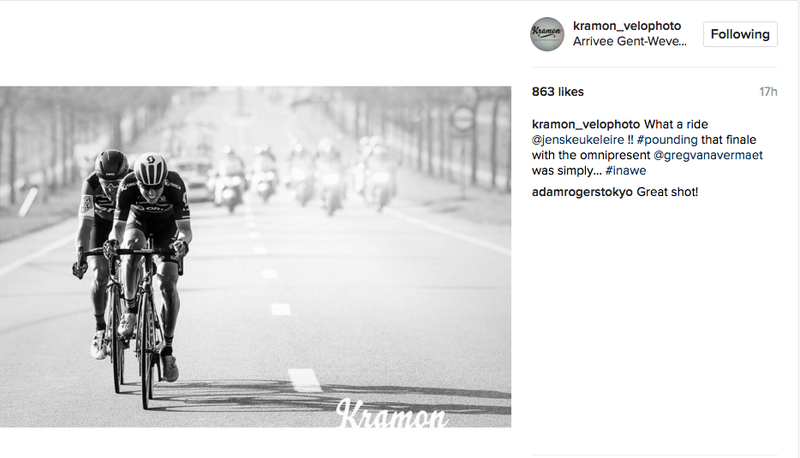 Once GVA and K’laire got the gap and Terpstra stopped taking his turn on the front, Sagan just stopped riding. And that made for a few little fireworks in the post-stage interview. 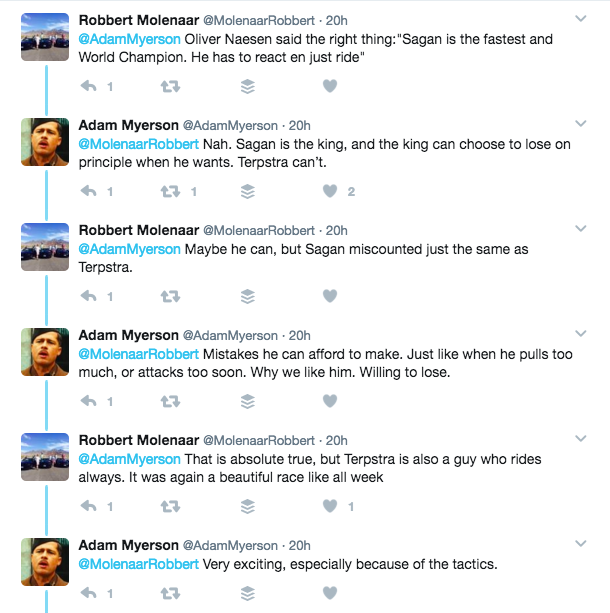 Terpstra, on the other hand, said it was for Sagan to do the work (well, he would say that, wouldn’t he) and bridge the gap, as he says in the badly Google-translated piece (click the picture to go to the whole article). 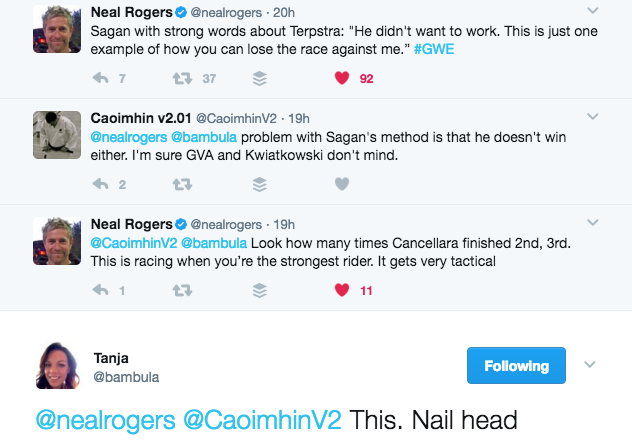 Not sure where he gets that reasoning, in that neither GVA nor K’laire were on his team so why wouldn’t Terppers chase? Hey, if you want to win a race, *you* have to do the work – don’t wait for someone else to. 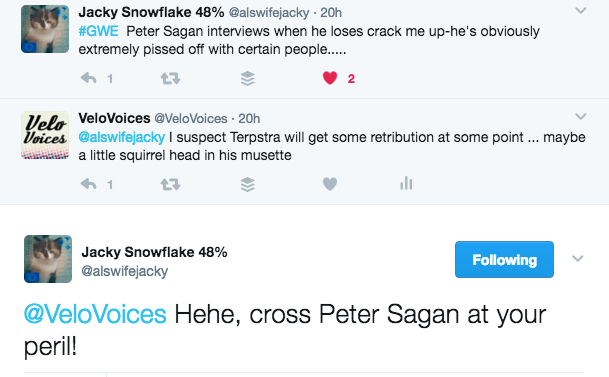 I reckon Sagan was wise to Terppers’ ways – there has been many a race where Niki feigns exhaustion in a break, only to suddenly try to nip in for the win. Oh so many ways, I don’t think we have the time to compile this montage … too much material to sift through. 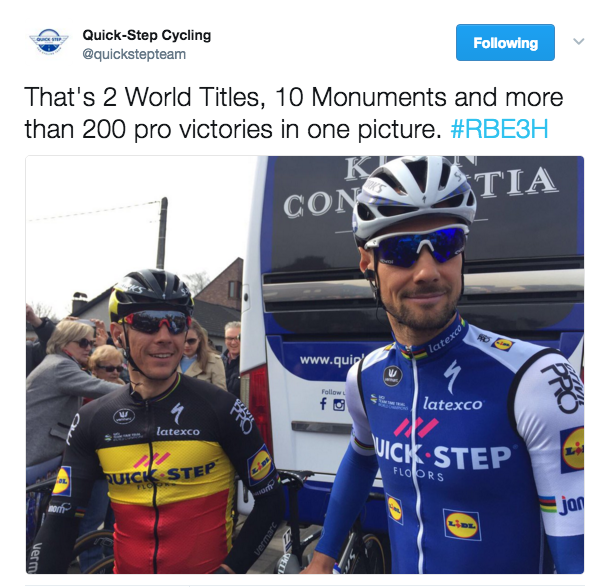 Make sure you check out Boonen’s Road to Roubaix series on the QuickStep site. 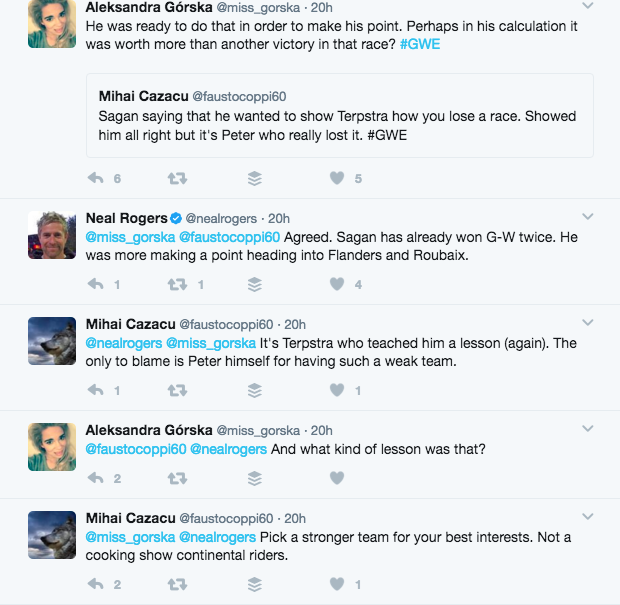 We only have him in the peloton for a few more weeks, kids. This first video looks like Bernie is in the epicentre of some sort of nuclear attack, but it comes clear in a sec. 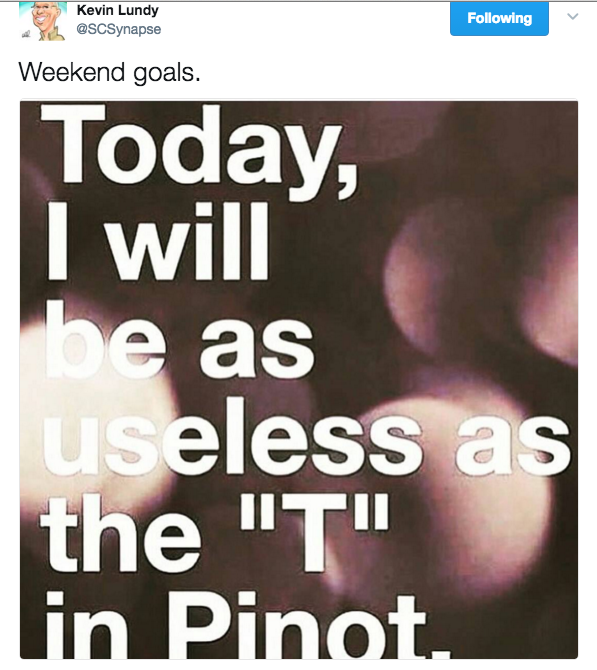 Stick with it. 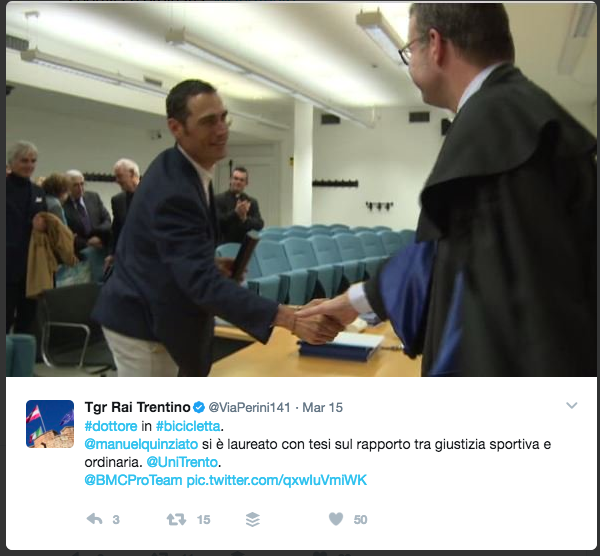 This happened a few weeks ago, but I wanted to give the wonderful Manuel Quinziato a proper congratulations on what is quite honestly an astounding accomplishment. 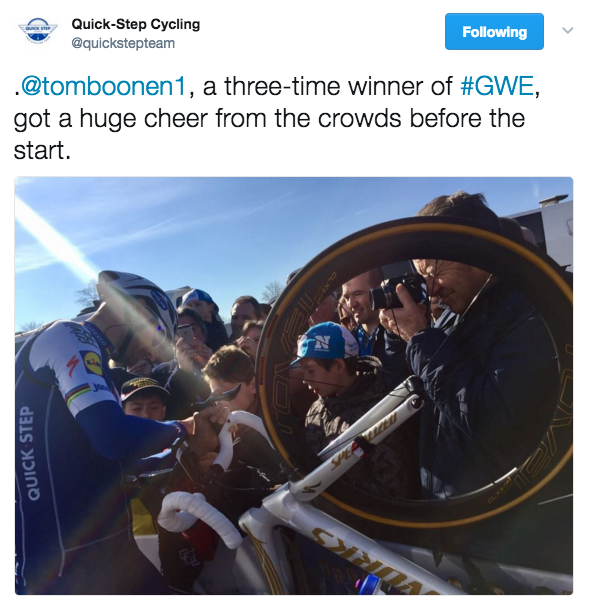 So, here we have our hero lining up for his 8th Gent-Wevelgem. 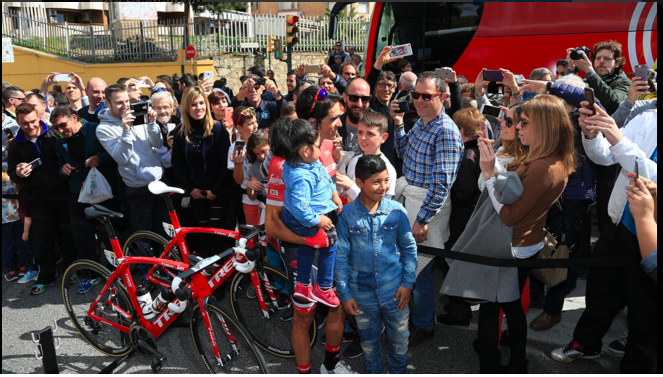 A stalwart road captain and rider of fierce joy, Quinziato has been a professional cyclist for somewhere in the region of 15 years. In that time, he has been on the road for more days than he’s been at home, he’s ridden in rain, sleet, snow, hot sun, he’s been in more bad hotel rooms than I’ve had hot dinners and he’s always had a smile on his face. 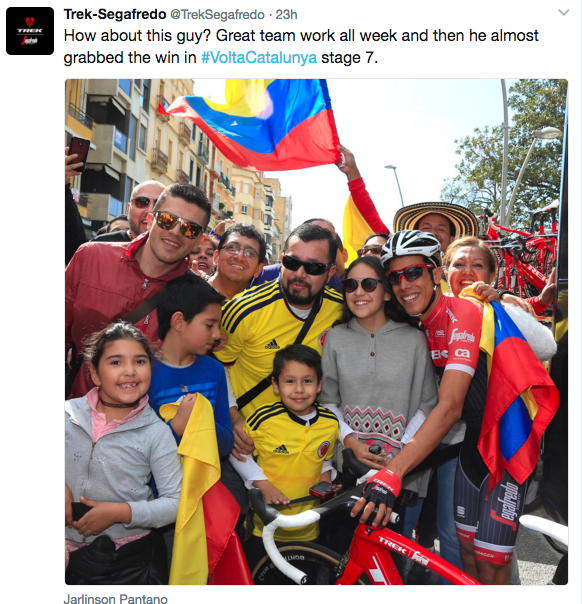 We love him here at VeloVoices Towers – he rides with heart. 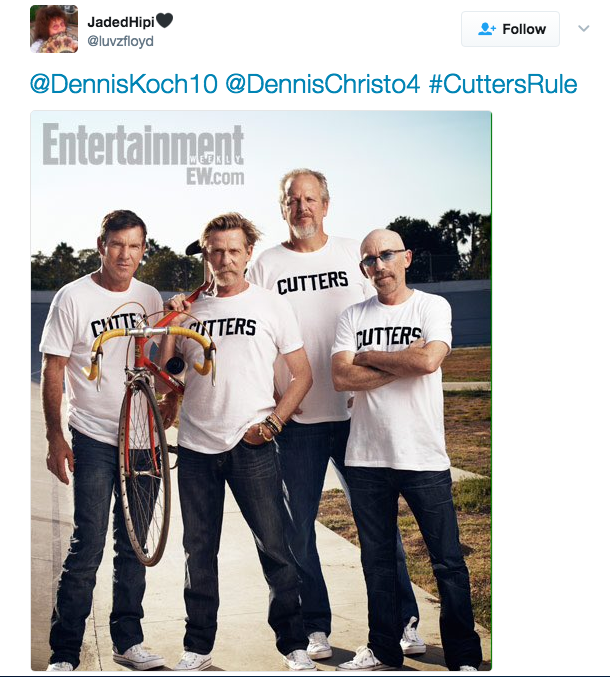 While he was spending so much time on his bike, what else has he been doing? 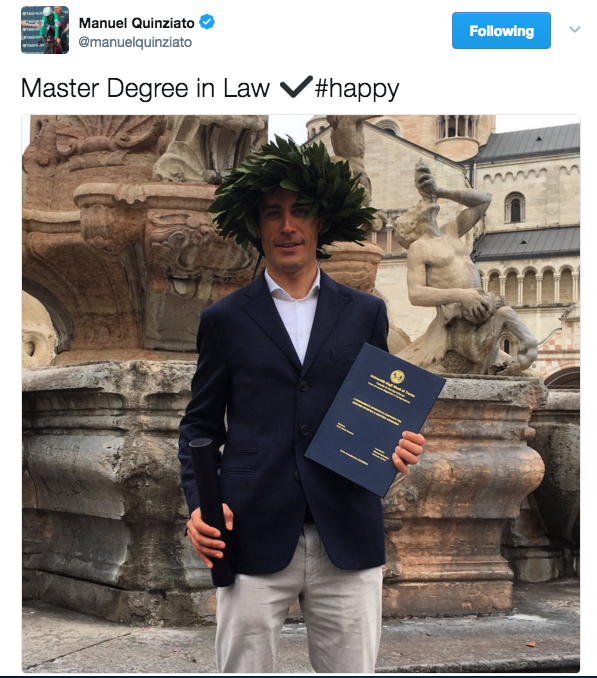 Getting a masters degree in law. Think about that for a second. I don’t know about you, but my office job is about all I can do in a day – studying for a law degree in my spare time would be a bridge too far. So consider the accomplishment if you have a physically taxing day job with constant travel for 9 months out of the year. 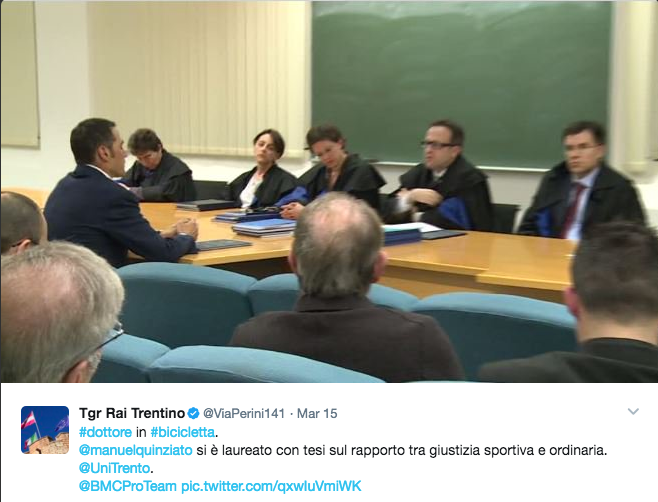 Manuel Quinziato – we salute you! 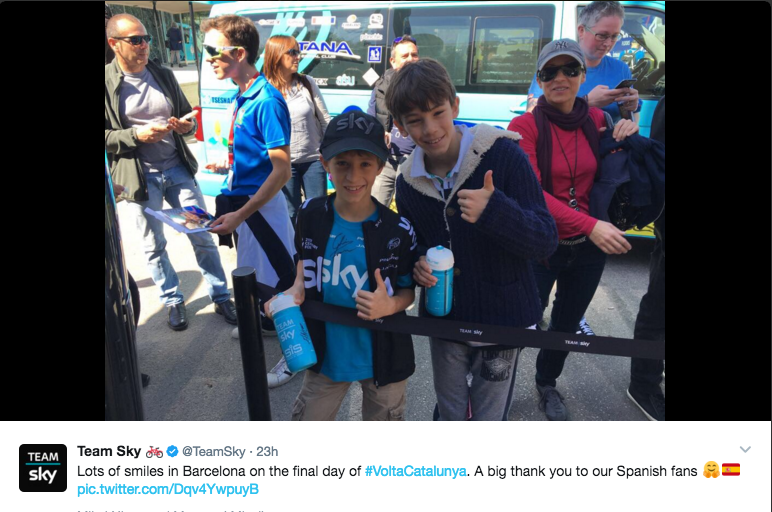 Happy fans, friendly cyclists in Barcelona. 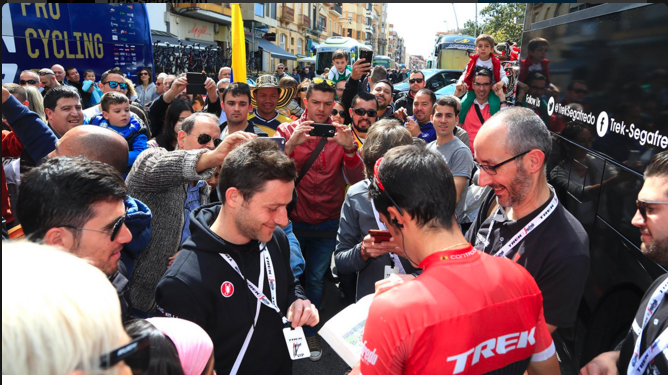 Part of the thrill of bike races! I think Taco van der Hoorn could be Steele van Hoff’s sidekick in a private eye business. Or a cop show duo: Taco & Steele!